<mafm> so I could introduce a class simulating network layer? <mafm> the camera coordinates at the moment? <mafm> contexts are minimum half of the window size? <brlcad> i understand, that doesn't change the pressing need for it .. Submitting final evaluation survey, and sending e-mail to the developer mailing list with the summary about the work done and future. (In trunk) Bug fixing: not using argv when argc<1, it tends to be crashy ;) (it happened to me when trying to use the library). I did some minor normalization in other commands, initializing the result and so on, hopefully I didn't introduce new bugs due to poor understanding of the way it works. (In trunk) Remove '#if GED_USE_RUN_RT', Sean did the same yesterday in libged but not here, so now it won't compile. 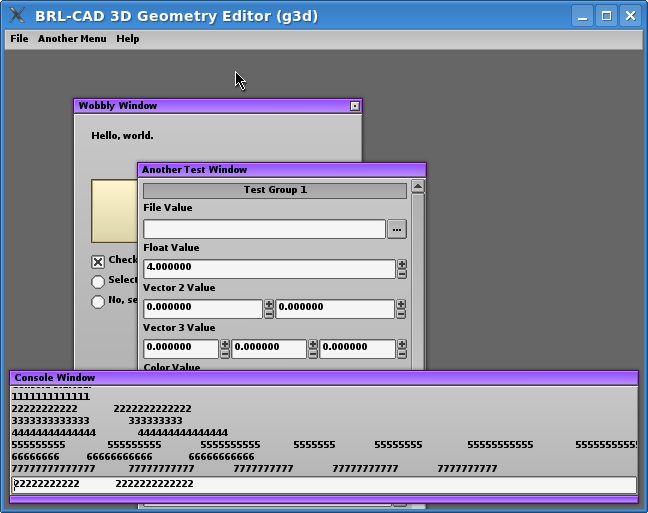 Fixing the commands in g3d using libged -- finally they are using the library correctly and libged is not crashing improperly. Fixing libged commands, now they at least give some result and mostly work. Using program-wide data structures for libged, instead of on-demand ones for testing until now. I was trying to get my commands using libged working, but no luck so far and no tangible code worth to commit. Preparing binary package so more people can test it. Unfortunately they're only for GNU/Linux amd64, since my personal laptop got screwed and I cannot install new systems in the computer at work. The packages are in: http://brlcad.org/~mafm/g3d-packages/ , some other libs are necessary in order to get it running: libfreeimage, libCg etc; easily available from your favourite distro or the Intertubes. Revisiting part of the code, removing some comments not applicable anymore and doing a bit of cleanup. Starting to prepare a binary package. Several other minor changes related with this. After a few days of weekend and relax visiting friends and family, came back to work. Continued working with the custom widget. It's not easy since it seems that some of the brush methods don't work (in example to draw lines), so I changed the strategy to use a kind of slider instead of a "pie" to represent the rotation. Enhancing camera modes by adding bindings for actions in the camera control window, and binding actions in camera control window with camera modes -- some previous code needed some modifications to get this working fine. 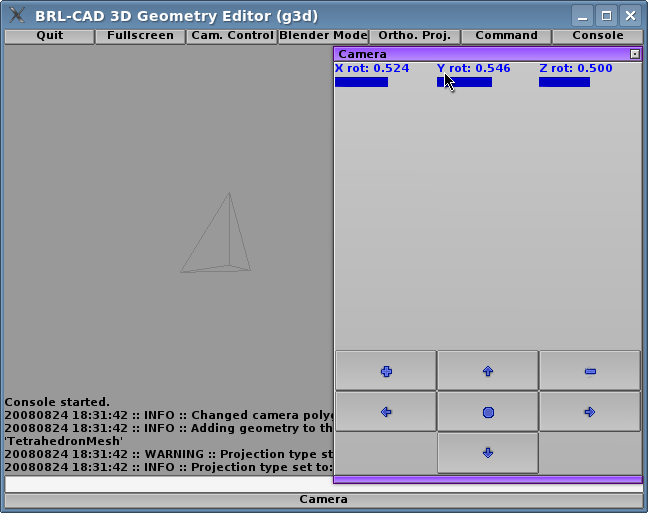 Working in the custom window and camera control, commiting code even if it doesn't work very well. Saving the state of camera rotations before dragging, so they continue to rotate from the current position instead of starting from scratch (for both Blender and MGED modes). Working in creating a new window to control the camera, including the creation of a custom Widget (as requested by Sean, to test how easy it is to achieve that with RBGui), but results not ready to commit yet because there are lots of glitches (images not showing in buttons when they should, etc). Fixing the problems with zooming in orthographic mode with minimum hassle, using some of the capabilities of OGRE (instead of previous trials modifying view matrices and so on). It works as expected with all current camera/input modes. Fixing the problems with panning when controlled by keyboard (currently for Blender Camera mode only). Fixing the problems with panning when controlled by mouse (currently for MGED/Shift-grips Camera mode only). In the end it was very simple, but only once we got the relative dimensions of the camera and we're working in orthogonal projection mode. 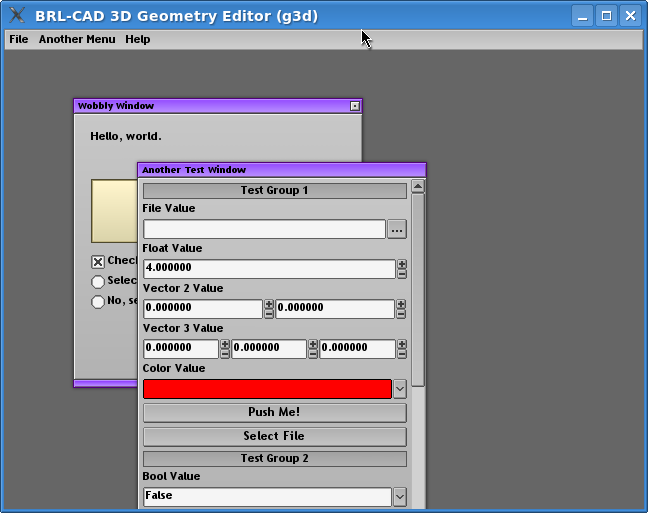 Adding support for different projections: orthogonal(orthographic)/perspective. Putting the control of Perspective/Orthogonal projection types in the CameraManager, so it's independent of the Camera/Input Modes (MGED, Blender, etc). When in orthogonal projection mode there's no concept of zooming, every object is projected with real size on the screen; so I started to look into how to emulate this by using view matrices and things like that. Continued working in Shift-grips/MGED camera mode, I almost have the "Normal View" working. Adding button to show and cycle camera mode in the topbar, and adding a command too to cycle mode. Separating camera modes (classes) in different files, as suggested by Sean. Starting to work in Shift-grips camera bindings. Completing Blender camera mode, and factoring out more functionality in the base class (now basically the different modes act only on input, defining the bindings, as Sean had suggested). Some commits correspond to work of yesterday. Setting limits to orbital camera mode, so it doesn't cause strange artifacts when verticalRotation is greater than PI/2 (or smaller than -PI/2). More work done but sourceforge's SVN has been unavailable due scheduled downtime -- some commits delayed for next day. Commited first serious code for handling camera, instead of the old hacks. It's the orbital mode, which it's very similar to the trackball mode (rotates around central the point of the scene, changing zoom distance and horizontal/vertical rotation), but it happens that I understand this well so it goes first. Thinking about how the other modes would be implemented, by extending the actions of the current camera mode. Still working in camera implementation, but unfortunately not much since I got sidetracked by job interviews. 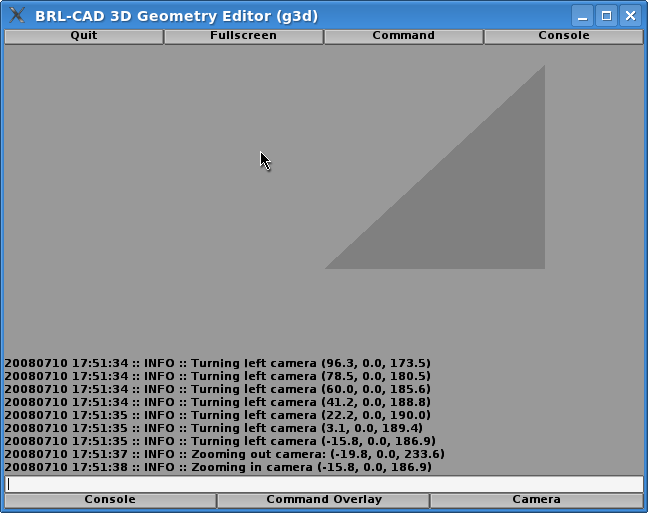 In the meanwhile, after talking with developers, scraped the idea of having a window for camera control, since: 1) it doesn't seem to fit into the "ideal operating environment" to have a small window present just for this, and 2) the basic camera modes should mimic what BRL-CAD uses already know, so no much point in making a visible interface for controlling it. There might be place for something in the top-panel showing camera mode and so on, maybe. Started to work in proper Camera controls implementation. Adding methods for basic camera manipulation. I'm waiting for confirmation from other devels, but I think that the proper thing to do is to create one or several camera modes with better and more complete functionality, encapsulated in a proper way. 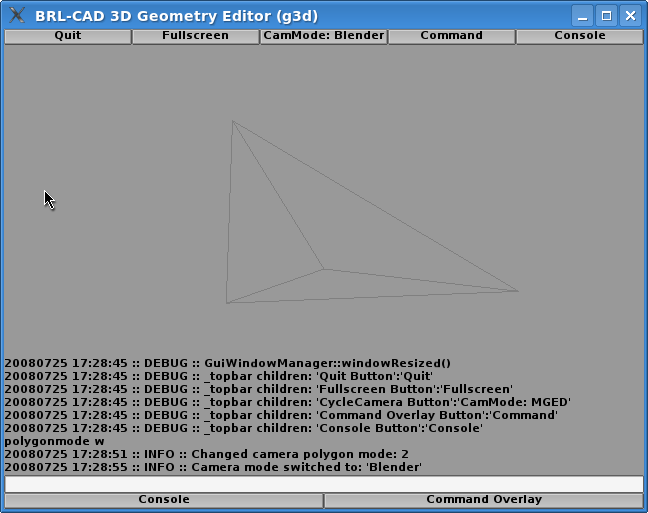 Adding GeometryConversion class, and modifying the "create geometry" command so we can create at least sample tetrahedrons. Trying to get manually-made geometries displayed in the window, with no successful results in the whole day. As I figured out later, it's not enough to create them as vertices list inside ManualObject, but it has to be created with indices so it can be made a Mesh, and then instantiate an Entity and add it to the SceneManager. And nowhere where they clearly tell you this. Pheeeeew. Continued working on automatic compilation of external dependencies (Ogre remained with some problems). Finally got all of them working smoothly in my system; but this will only happen for certain systems -- probably only GNU/Linux and at most FreeBSD; and some manual intervention for MacOSX. Writing instructions about building, so hopefully with both of these issues "resolved" we will get more people willing test it. Creating pkg-config files from CMake files in Mocha and RBGui so no static external files are needed (and as a consequence now it uses CMake variables for choosing the destination of the installed files, in example). This work should mean a step forward in the desired direction, but it's not very well tested and most certainly it won't work right away for non-modern-Unix systems. Moving basic window creation, operations and settings to base class, so we abstract and protect a bit more the code from the GUI libraries that we're using underneath. Other general enhancements: making public-accesable attributes read-only (const) in the Observer events, decoupling a bit more functionality of the Console from the widgets implementing it, etc. Adding a couple of commands (quit, set log level); enhancing the command display (help), and the flexibility to show information about commands themselves. Improvements to Logger class: checks when setting new level so it's a correct one, made it a ObserverSubject so other classes can attach and receive interesting events (e.g. the Console, to show also the log messages in there). Substituted private Listener implementations for the more general Observer pattern, so we'll [hopefully] have less hassles when adding/modifying code in the future. The update() operation in the Observer is event-based, and the events are subclassed and identified by RTTI -- so we only need to create new types of events and program the reaction to them by the observers, no need to touch the rest of the code. Working to create the Command Interpreter (to use in conjunction with console-like windows), still a work in progress. Mostly revisiting the code created so far (and commiting minor enhancements and fixes here and there), testing the features and preparing a bit the next steps (loading geometry and so on). Creating buttons in the top toolbar to quit the application and toggle visibility of console and command overlay. 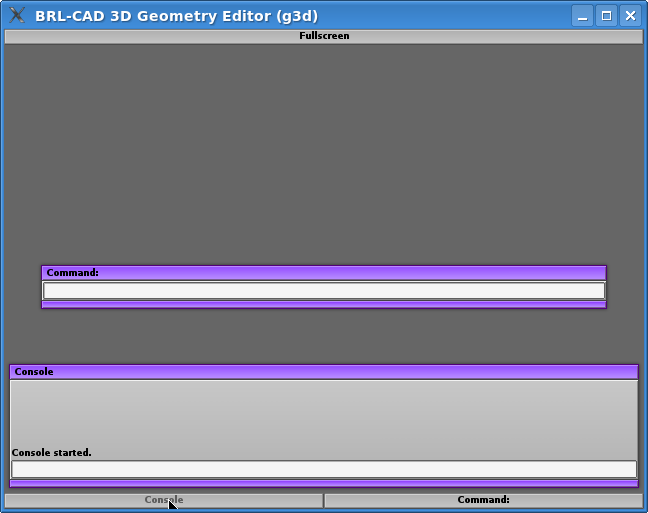 Enhancing usability and consistency of Command and Console, such as focusing the prompt and closing command overlay automatically with each command entered. Disabling keyboard and mouse grabbing in X11, so it doesn't disturb the user too much in the case of program hangs and the like (OIS defaults are really annoying). Fix of many small glitches, doxygen documentation, cleanups and renamings for consistency. Starting to look into Ogre geometries. Spent half the afternoon investigating and fixing a problem with Ogre Singleton intantiations. It turns out that their implementation allows you to create objects from classes which are Singletons, and that kinds of cause weird problems. New Window Manager class, to act as high level decision-maker about layout; and things like taking into account created windows (and deciding which ones to show in taskbar), so I think that "assimilates" the Taskbar class too, and thus I removed it as separate class. New panel in the top, which will be used for context operations, setting fullscreen modes and things like that. Making Application and GuiWindowManager classes a Singleton, so they can be accessed from elsewhere without having to pass pointers around all the time (it's needed for the "toggle fullscreen" functionality, in example). Watching again the video about "ideal interaction", for inspiration and to create a list of ideas to implement. I would like to have a chat about this though, to see the differences that we need to apply to our program. Finished commiting OGRE (lots of hours spent seeking mime-types to meet SVN hooks' requirements), and also commiting Mocha and RBGui and brief, rudimentary building instructions. Starting to commit 3rd party libraries needed for all this to work: OGRE and OIS. Only OIS could be commited, at last. Sidetracked by work and bureaucracy, couldn't do almost anything. Preparing and uploading RBGui files (theme, shaders, images, fonts), OGRE config files are to be generated on the fly (they contain paths depending on installation options). Getting the current code to compile with CMake in a clean fashion (without hardcoded system, in example). I think that it's a good base and a very important step. Starting to look into putting data files in place, creating a proper build system and all that. Looking into ideas to implement the User Interface. A bit of work reorganizing code, making Doxygen documentation, removing leaks (even if the objects only are to be removed when the application closes anyway) and the like. I wrote to RBGui guys to know if they're interested in patches to support at least my platform (Debian GNU/Linux, amd64 -- but at least Linux and POSIX systems by extension) instead of having to maintain private patches. I need ideas and directions about what things to implement (e.g. how to implement console window, if I should use logging from libbu or making my own method, for a start). OIS (the input library) is giving problems with auto-repeat, a problem that already had several years ago: it disables auto-repeat from X, so the rest of the applications in that DISPLAY that capability, and if the application crashes before OIS restores it, you have to reset it by hand. This looks unacceptable to me, but I haven't devised any solution yet. 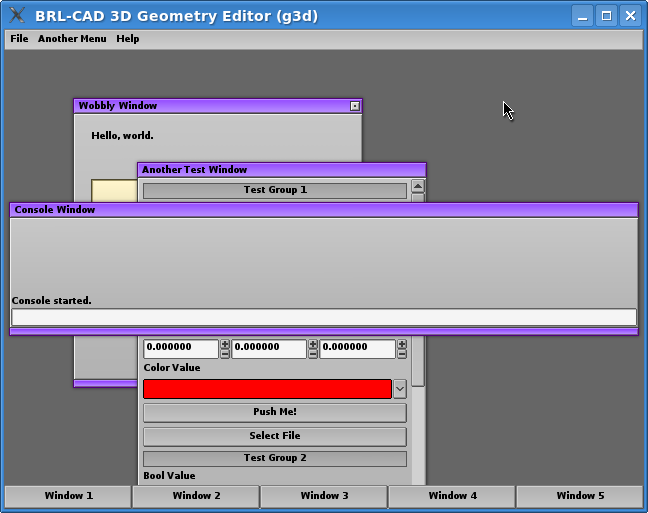 Mostly working in the Console window & functionality, still quite a lot of work to be finished. Getting RBGui sample application to work, reading "administrative" information of rt^3 module and in general preparing for submitting the code. 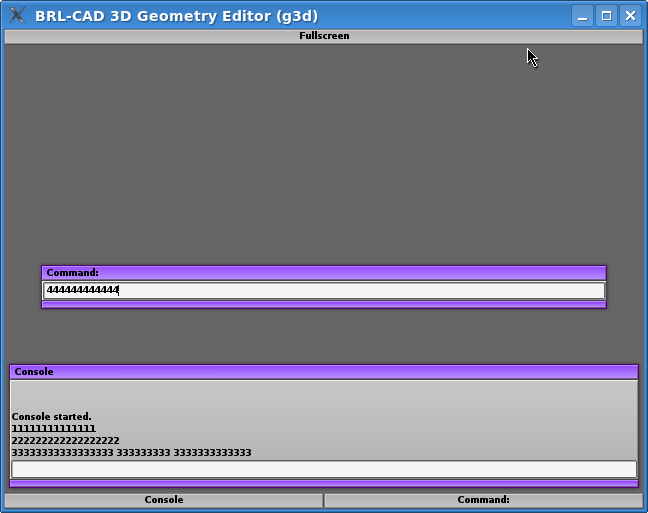 Commiting first patches, it's basically the example application coming with RBGui. Patching and recompiling other branches needed of some of the components, RBGui doesn't work with the most recent stable versions of OGRE right away. Investigating a bit about other GUIs, updates on the considered GUIs, etc; with no interesting results: things are basically the same as when making the application. Compiling OGRE and OIS (input system, needed for most applications using OGRE), since latest stable versions are not available in Debian. No big hassles. Compiling Mocha, a library needed by RBGui with misc utilities (3D math and the like) -- found a source RPM with minor patches for GNU/Linux systems, again no big problems. 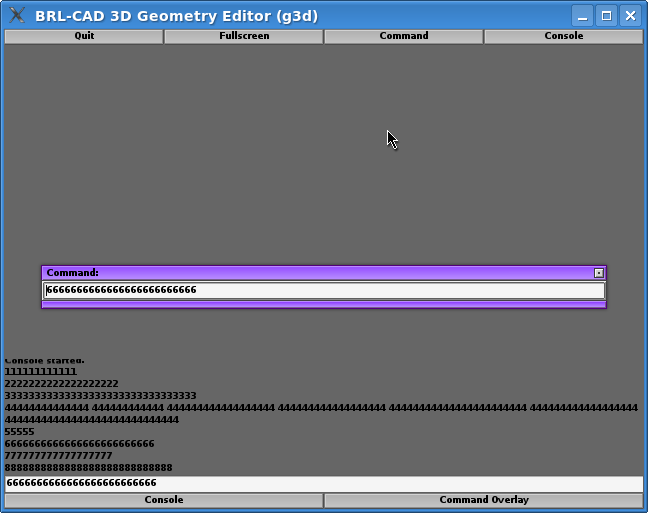 Compiling RBGui... this one is not so easy. Some CMake config files have to be modified, at least for my 64 bit system; and it's not in sync with OGRE (it seems to use some special function) so it doesn't compile successfully, yet. Misc. preparations: compiling up-to-date BRL-CAD, re-enabling subscriptions to mailing lists, and checking the tools to use (OGRE, RBGui). Not a very productive day, but not so bad to be the 1st day after weeks of overworking and travelling... and at least it's a start! Back to Lisbon, at last. Hopefully tomorrow I'll start coding! Due to some personal problems and exam dates (as already noted when submitting the application) I couldn't start coding or submitting patches to get commit access, note sure if I'll be able to start before June 5th or so. This page was last edited on 24 August 2008, at 13:39.